Like all of Google’s features, the aim of rich snippets is to help people find the most relevant search result quickly and efficiently. A normal snippet from Google would include the title in blue, the URL in green and the description of that what page is about. A rich snippet contains much more information, perhaps a product rating, the number of calories in a recipe, or the expected time a DIY task may take. 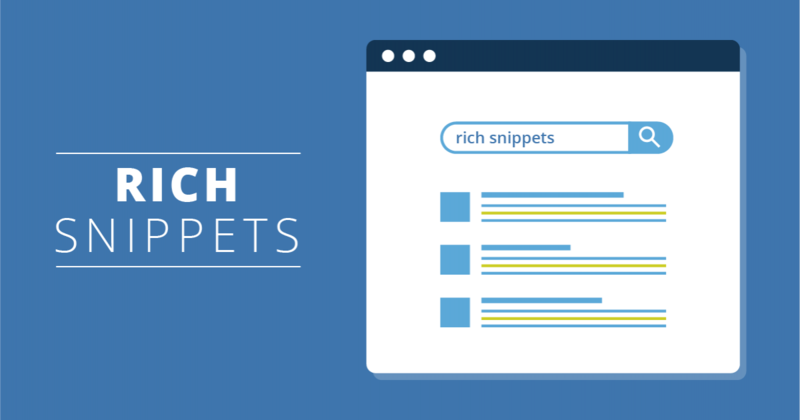 What is the difference between rich snippets and featured snippets? While rich snippets are the enhancement of an organic search result. A featured snippet is an answer to query which appears above all other organic research results in position zero. Do rich snippets help SEO? Google has made it clear that rich snippets do not directly affect site rankings; however, they can generate SEO benefits. Rich snippets contain more information, so they must take up more space. And this extra information is likely to stand out against other search results, especially the yellow star ratings. The more informed a user’s decision is, the more confident they are to click on that page believing it will provide the right information. Which is why rich snippets have higher click-through rates and, in addition to that, the more information there is, the more likely it is that the page will provide the information a user is looking for and the likelihood of them bouncing off the page decreases. Increased traffic and decreased bounce rates will certainly help your website in the eyes of SERPs as they see people are preferring and staying on your page. In the long run, this will increase your rankings. The first thing to note is that Google can disable your rich snippets if they do not meet their high standards of relevancy. Essentially, you need to focus on trying to pre-qualify traffic to your page, rather than using this as an area to repeat your keywords without providing any additional value. They offer a Structured Data Testing Tool so you can work out whether you are using the right code for your site, as well as giving tips on how to use them most effectively. Within Google Search Console there is a structured data report that tracks any errors or missing information alongside how to fix the markup. And the Data Highlighter tool allows you to tag data fields by highlighting them and then creates the structured data you need to add to your page. How do you optimise rich snippets? Domain authority can be an important factor for optimisation as studies have shown you can opt-in for rich snippets if you are currently ranking on the first page for that search term. Summarising the search term you are trying to rank for in a short paragraph, list or table. H1, H2 or H3 tags that directly answer the search query (relevancy is more important here than keywords). Images or graphics to attract attention and simply explain a search query. Creating and optimising rich snippets does take a lot of research, creativity and time, but the results far exceed the hassle.